Generally at the beginning of yoga class as you settle in and concentrate on your breathing, the teacher will ask you to set an intention for your practice ..
I’ve found this much easier to do now that I practice at home, because by that point I’ve already decided what I want to work on and have then gone onto select the appropriate instructor and class. Take today for example – Wednesday is a run day, which means I run straight after work, therefore I’ll get home later than usual (right around the kids dinner time). Then, as soon as I step through the door it will be all go! I might (if I’m lucky) sneak in a short bedtime yoga class just before I head to bed but as that isn’t a certainty and I’ve pledged to do yoga everyday during the month of October I scheduled my yoga practice for first thing this morning. Early mornings are usually set aside for cardio and/or weight training – I like to start out my day working up a sweat, it makes me feel invigorated and ready to kick the arse out of the upcoming day (well unless I pull a muscle or something .. ) so I knew that I’d go with some form of power yoga, because my intention was to work up a sweat! Being able to select a class based on what I need at any given moment is one of the biggest advantages of practicing yoga at home and it makes sticking to my #doyogaeveryday in October “challenge” that much easier, especially when you think about the “usual” excuses people come up with to drop out of practicing regularly such as not having enough time. I’m cheap and Youtube has free yoga classes in abundance! No driving (gas money) to a studio (members fees). I don’t have to fit into a schedule – I’ve yet to find a yoga studio that has classes on when I want to practice (especially on weekends). It would seem that Yogi’s are just not early morning peeps. If I’m stuck on a move/transition, I can pause the video and give it another go. In our last house I had a wee room that was dedicated just to yoga (I also kept my spin bike in there) but at this house I do yoga wherever I lay out my mat and can get a wifi signal. The majority of the time I’m in the downstairs lounge while the kids try and kill each other play but on ocassion I’ll do a session in the garage (after working out) or when God is smiling down on me and the wifi signal reaches my bedroom I’ll do a class there. The bedroom is where I prefer to do any restorative yoga sessions, because our room is small, warm and quiet. EG – I can’t hear the kids killing each other playing. 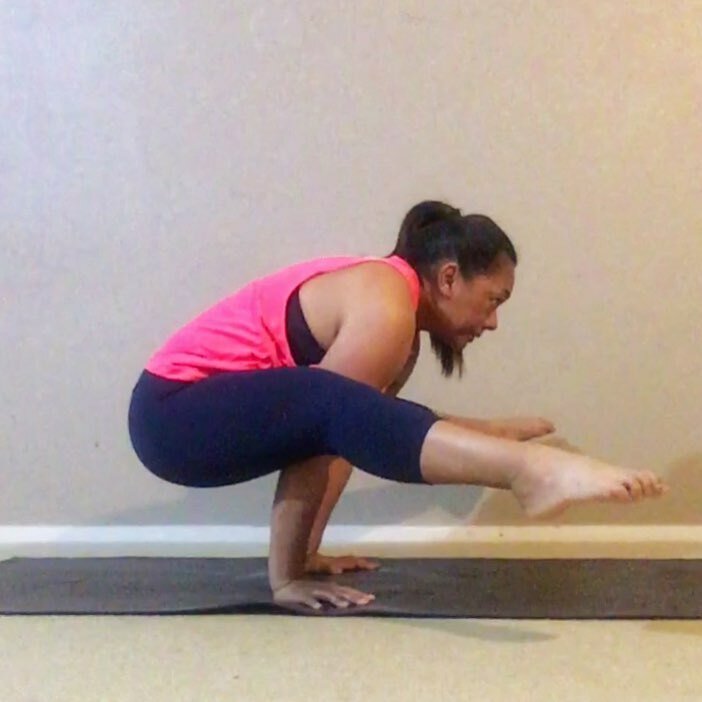 Now, I will say that I am not a complete beginner when it comes to Yoga, having previously practiced in a studio environment so it’s probably easier for me to follow online videos than it would be for someone who has no background in yoga. If you are interested in setting up a home practice it may be helpful if you do at least a couple of classes at a studio or gym. Being able to follow a teachers instruction without looking at the TV screen constantly makes your practice much more fluid (and enjoyable). If you want to start but don’t quite know how yet this 30 day challenge with Erin Motz is a great starting point – no yoga experience required!